Air Vanuatu CEO Derek Nice says that it is likely the airline will have eight large aircraft for the international sector and five Cessna Caravans for the domestic sector by 2030. Monday marked a milestone for Vanuatu when Prime Minister Charlot Salwai officially launched “Shared Vision 2030” for Aviation and Tourism. The launching which took place at the Prime Minister’s Office was witnessed by Deputy Prime Minister Bob Loughman, Minister of Education Jean Pierre Nirua, Minister of Infrastructure Christophe Emelee, Minister of Finance Gaetan Pikioune along with diplomatic coups and certain dignitaries from the tourism sector. The Prime Minister assured the Vanuatu Government and Council of Ministers are committed to supporting this vision. He further expressed concern saying that the government has provided substantial financial support to the national airline Air Vanuatu and he hopes to see some beneficial return. Aviation and tourism are dependent on each other and to see the tourism sector grow, the aviation sector would have to grow as well. PM Salwai mentioned that Air Vanuatu is developing its route sector. In developing the route sector, research is now being carried out for the airline to fly to new Asian and North American destinations. Salwai also stressed that the government is not only there to bail Air Vanuatu out of problems but also expects the carrier to provide good service to the people. 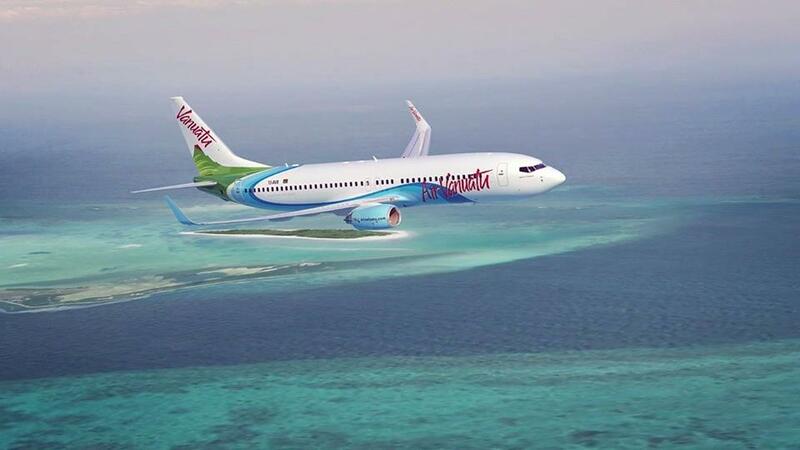 Air Vanuatu is also in the process of acquiring new aircraft, however the exact type has not been decided yet. Air Vanuatu CEO Derick Nice told Buzz FM 96 that by the year 2030 the airline is likely to have 8 large aircraft for the international sector and 5 Cessna Caravans for the domestic sector. The CEO wasn’t specific about the exact number of ATR 42s. With more aircraft, the number of visitors to Vanuatu would definitely increase. The international sector is not only in the development plan but the domestic sector is as well. The Prime Minister stated the Cessna C208 Caravan is the most likely aircraft to join the domestic fleet. It is a single engine turbo prop aircraft and can seat from 10 – 14 passengers. The advantage that this aircraft has is large cargo hold which can carry more than the Britten Norman Islander which the airline currently operates. To add on to the C208, the ATR 42 aircraft would also join the domestic fleet. They are smaller than the ATR 72 aircraft which are currently used and can land on the shorter runways which the ATR 72 cannot access. With new aircraft, there would be a need for new pilots. Minister Nirua mentioned that his Ministry, through an MOU with Air Vanuatu is now working to produce up to 140 pilots by the 2030. Air Vanuatu CEO, Derick Nice confirmed there would be a need for a large pool of new pilots both trained and already here in Vanuatu and those to be trained through the scholarship system to match the growth of the airline and that they are developing a strategy for hiring, training and progressing pilots through the system. In terms of airport capabilities to match the airline growth. Airports Vanuatu Ltd CEO, Jason Rakau mentioned that Bauerfield Airport works are almost complete and that the runway would be able to take code E aircraft. The prime minister stressed that before looking for other countries to fund this project, it is better to look within and see what the government could fund on its own. He also called upon the Agriculture sector to join the Shared Vision as there would be a need to feed more visitors when they come in with local produce rather rely on imports. A task force for Shared Vision 2030 was also established. It includes Air Vanuatu CEO Nice, Airports Vanuatu Ltd CEO Jason Rakau and National Tourism Office CEO Adele Issachar Aru.